After a year of being in Cedar City full time (for our first year we had an apartment in Houston and spent half the time in Cedar and half the time in the Apartment at the Barker Reservoir [see Song 114 – Barker Reservoir, Song 350 – Downsizing, Song 351 – Enjoy the View, Song 353 – New Wood Floors, Song 355 – Shadows, Song 356 – Snow Falling, and Song 362 – The Move]), it was time for the annual Fathers & Son’s Campout (see Song 028 – Fathers & Sons) for the Hillcrest Ward. This tradition is tied to the restoration of the Aaronic Priesthood to Joseph Smith and Oliver Cowdrey by the resurrected John the Baptist. We did not have a conflict, and so I put my sleeping back and guitar in the car and drove to Yankee Meadows campground. 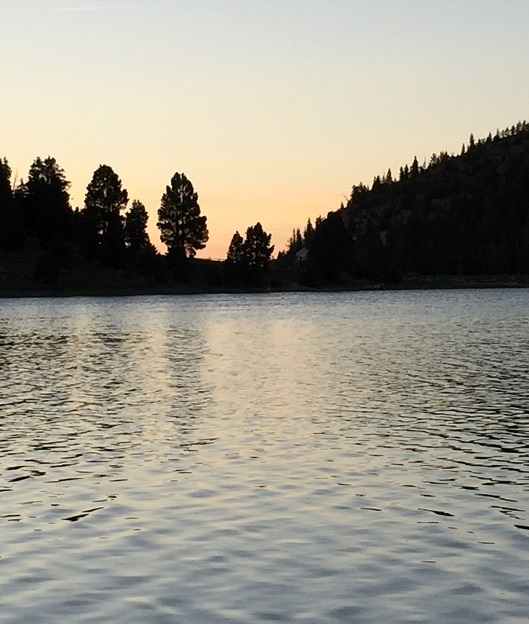 The campground is a few miles downstream from Yankee Meadows Reservoir, which is what the photo and the extended photo are showing. This song was in the same spirit as all of the scout campouts I went on when in Nottingham Country Ward. It is a ballad, recounting each of the major things I remembered from the campout. Klaus Mans, my Home Teaching Companion, went up early and saved the place. Dustyn Johnson and his son Cole took me in their car to go fishing. James Froyd, who was in my High School Class, cooked hamburgers for dinner. Michael Barrick, who is our dentist, told funny stories about fireworks falling over and shooting at their neighbor. Little boys found a femur and a jawbone and were running around chasing each other like The Flintstones. Kelin Bleazard flew his drone. I sang my song about Fathers & Sons to James Froyd. Bishop Orton bore testimony of the restoration. I slept in the car, and when I got up to go to the toilet, set off my car alarm, and woke up the entire camp. Oh well! Good memories. And we never know when they will come back to us. Grant Siebert was recently awarded his Eagle in the Katy Stake the first part of August 2018. He was asked who influenced him and who he wanted to give the Eagle Mentor Pin to. He said “Roice Nelson, because he played his guitar and sang” when Grant went through his Webelo’s Bridging or Crossover Ceremony from Cub Scouts to Boy Scouts. Who knows the impact we have had? Now all of the trees at Yankee Meadows have been burned down because of the Brian Head Forest Fire. We never know what will come back to us.